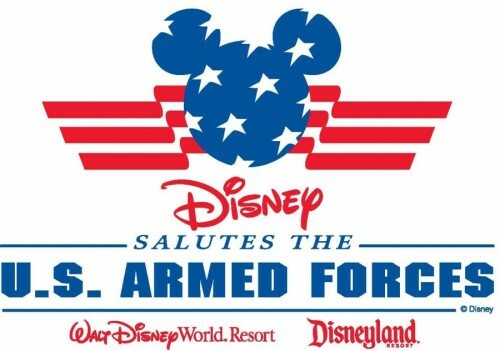 Update: April 19, 2011, Walt Disney World has just announced an extension of the Armed Forces Salut Tickets to cover through October 2, 2012, along with an extension of the military discount on the Disney World resort rooms. The ticket prices will remain the same. If you purchased your allotment of tickets during the 2011 dates prior to October 1, 2011, you are eligible for additional tickets during the 2012 dates. Update: June 12, 2011, We have just received notice that the 2012 tickets will be basically unlimited. For travel between October 1, 2011 and October 2, 2012, eligible military members will be able to purchase an unlimited number of discounted park pases. You will be limited to purchasing 6 at a time, but no limit on the total. Walt Disney World has just announced that Active and Retired U.S. Military, including members of the U.S. Coast Guard and active members of the National Guard or Reservists, may purchase 4-Day Walt Disney World Armed Forces Salute Tickets for themselves and up to five (5) family members and/or friends from $138 each. That is a maximum total of 6 tickets that can be purchased by each military member. Please note these ticket prices do not include tax. If purchased on base or at Shades of Green, no sales tax will be charged, but tickets purchased at WDW ticket windows will incur sales tax. The Park Hopping ticket is valid for four days of admission into the four Walt Disney World theme parks (Magic Kingdom, Epcot, Hollywood Studios or Animal Kingdom Park). The Water Park and More option gives guests a total of four visits to a choice of a Disney water park, DisneyQuest Indoor Interactive Theme Park or certain other attractions. During this offer period, active or retired U.S. military personnel may make a one-time purchase of up to a maximum of six 4-Day tickets (one theme park per day) for family members (including spouse) or friends. All tickets and options are non-transferable and must be activated and purchased by September 28, 2011. Black out dates exist for these tickets. They may not be used at all between December 27 – 31, 2010, April 17 – 23, 2011 at all Disney World theme parks, and July 4, 2011 at Magic Kingdom only. Vouchers are available for purchase at Shades of Green and on military bases beginning October 24, 2010, tax free. You must then take the voucher to a WDW ticket window and exchange for a ticket. Tickets are also available for purchase at Disney World ticket windows, but this purchase will be taxed. In addition to the available Walt Disney World tickets, Disneyland will be offering $99 tickets good for 3 days at the two Disneyland theme parks. The same restrictions apply. Wow, how exciting, thank you so much for posting this. I probably wouldn’t have known otherwise. Is there an expiration date on these? Steph – Sorry, looks like I didn’t make that clear. These tickets expire October 1, 2011. There is on limit on when you use the four days, as long as they are used by 10/1/11, so you can use two days one trip, and two days another trip several months later. Keith, I believe you are mistaken. Still not a bad deal and wonderful of Disney to offer this to our military families. Tracey – I am not sure what the problem is with your first statement, I clearly noted that the tickets cannot be used those dates, they are blacked out. Disney Military Promotional Tickets (including any options) expire and may not be used after Oct. 1, 2011. The no-expiration option, which is not available, would extend the expiration past October 1, 2011. The four days on the tickets can be used at anytime between purchase and 10/1/11, they do not expire 14 days from first use. what part is unclear. Your statement to Steph is misleading. You stated they can be used anytime before Oct 1, 2011. You failed to mention the black-out dates in your reply to Steph. Tracey – Sorry, I was unaware that I needed to repost the entire article in each comment, since the black out dates are posted above, no need to repost dates , it is understood. Please note these are not normal tickets. You are correct, when purchasing normal theme park tickets, they expire 14 days from first use. With military tickets, they DO NOT expire 14 days from first use, they expire October 1, 2011, regardless of when they are first used. If you have any questions, or do not believe me, feel free to call Shades of Green or Walt Disney World ticketing. I just did. If you could please offer a reference for the military tickets being special I’d greatly appreciate it, as I have been unable to locate anything stating these tickets are in any way special outside the amazing price. Aside from calling, I prefer to see it in writing from the source. Unfortunately, our typically dishonest society has made me that way. You will notice on each of them they clearly state that the tickets expire October 1, 2011. There is no other mention of expiration. All of the past military tickets had the same expiration details, they did not expire until the expiration date, which was the end of the offer period. On many of these military deals, you must call Shades of Green to get the complete story. I called both Shades of Green and Disney World ticketing, both told the same thing on the phone. It is truly sad that Disney and others only give such benefits to active and retired military. As an 18 year non retired veteran this hurts more deeply than words can express. Ken – Have you called Shades of Green to see if you qualify? Another interesting fact I thought I would add for people like me, is the availability to trade your tickets in if you are unable to use them by the expiration date. We bought the military ones this past year, but my husband unfortunately was not able to come home from Iraq until after they expired.. I was frantic and called Disney. They informed me that we do not “lose” the money invested in unused tickets that have not been activated (vouchers that we never were able to go and get actual tickets to use). You can trade, not add, not transfer, but trade them in for other tickets where the money you paid on these tickets is applied to the new ticket pricing.. So you will be paying more for the tickets, but in essence you put a down payment on them when you bought the military ones. And you can trade them in for any day combo.. ie: 2 day, 3 day, 4 day, etc.. I am gonna double check but this should mean for us that we can trade in our vouchers from last year and pay 40 more per ticket and still receive the new military tickets. Tiffany – thanks for the note. The ticket cost can also be applied to annual passes and other tickets (seasonal Florida resident passes, etc). Dianna – No problem, hope you can use this great deal! Mike – Tickets are not required to the Disney theme parks for kids 2 and under, so you will not need to purchase a ticket for your daughter, she will be free. The tickets are open to any of the four Disney theme parks, you could spend all four days in one park if you wish, or visit all four parks over the four days, up to you. If you have the hopping option on the tickets, you can then go to more than one park per day. Any chance Disney would consider making these tickets good for 6 or 7 days? Most vacatiions are one week. I took my family to Disney World earlier this year and took advantage of these tickets. First off – THANKS for offering this benefit! But my trip was Saturday to Saturday. Essentially 6 park use days. So even with Park Hopper and Water Parks and More, we still needed to pay for an additional day at regular prices. (A GREAT time was had by all and we WILL lbe back) Just a thought. I always thought it was strange, that they limited the length of the tickets, but these are a result of negotiations between Disney and the military, one of them must have a reason why they want them limited. A few years ago, you could extend the purchased ones by adding days to them once there, but for 2010 and 2011, they have removed that option. I guess you can always look at purchasing 2 for each person, but then you are close to the regular price for tickets. I might suggest you give Shades of Green a call and voice your concern over the length of the tickets, maybe they will take that into consideration next time around. Would the military member or spouse have to be present to trade the purchased vouchers in for tickets at the park? For example, if I bought vouchers on base with a military ID, but then ended up not being able to go with my extended family (civilians), could they still redeem them at the park without me and my military ID for admission? Do any of the Disney cruise lines offer any military discounts for families? I know every year for Disney parks have offered something but was wondering about the cruise lines. They are usually made available on short notice, so right now, only November and December cruises are listed. I am retired Air Force and I have a question about redeeming the voucher – if I purchase the voucher on base do I have to be at WDW with my military ID again to redeem the tickets. I would like to give to my son for a wedding present but I don’t think that they would like me to be there for the Honeymoon. Is there another option that I can use? Julia and Theresa – Sorry, I cannot answer questions about availability or usage. I would suggest you call Disney at 407-939-7830 or Shades of Green. Julia or Theresa, have either of you called to check things out? If not, I will give them a call and see, thanks! Where can military go to purchase the tickets other than Shades of Green – the Disney website lists to go to “U.S. military base ticket offices for Disney Military Promotional Tickets”. Where would that be? Stacy – You will need to go on base to your MWR or ITT office, they are the only ones who can sell tickets other than Shades of Green or at the WDW Ticket windows. If I want to buy an annual pass at Disneyland, are there any cost savings? The first time I called Disneyland, they clearly stated that I would be able to deduct $99 from the price of the annual pass. The second time I called, they stated that I would be required to purchase a 3-day pass for $99, then convert that to an annual pass resulting in zero cost savings. Karen – I am not aware of any military discounts on annual passes for Disneyland, you may want to check with your MWR/ITT to see if they have any info. The second answer is correct, you can convert any park pass, including the military tickets, into annual passes. It doesn’t save you any money, but you can do it. I have called MWR and they told me the black out dates are December 27-31. I even received email and said that the blackout dates were December 27-31. So I’m a little confuse I was going to buy my tickets already!! Vanessa – Black out dates are December 27 – 31, you are correct, it was a typo in the post which has now been fixed. Sorry! Went to Disney this weekend and wanted to confirm some information. We were able to trade in our unused vouchers from last year and pay the difference for the new vouchers. You are able to use them any time, in any day increments until the expiration date in Oct. You do not have to use subsequent days within 14 days of first day use. We had a wonderful time! We opted for the 4 days of disney plus 4 days of water park and more fun.. This gives us a total of 8 days of disney and water fun. We used 2 days of magic kingdom, plan to return in the spring for the other 2, and then 4 days in the summer for water fun. We have 4 kids, so it was not a problem for us to only go to one park a day as it is difficult to move around the parks w/ that many children. You can choose to visit a water park and one of the disney resort parks in the same day.. just not more than one disney resort park in the same day. You can go back and forth between the park of choice for the day and a water park. Magic Kingdom was decorated for christmas and it was just beautiful! Tiffany – Thanks for the update, glad you are getting good use out of your tickets! I echo Ken’s sentiment; my husband and I each served 12 years Army, and yet somehow we’re never treated as “real” veterans. If anyone finds out that an Honorable D/C DD-214 can get one treated as a “veteran” please post. Karen- If you go through ITT you get a whopping $9.50 discount on premium passes. Just to let you know. How do I get the voucher I need to present at Shades of Green to get Armed forces Salute tickets? Jerry – No voucher is needed, just show your military ID at Shades of Green to purchase tickets there. I am 100% disabled and my id card says DAV/PRM, I called my local itt ticket office and I called disney and I was told by both that I am not eligible for the military special that disney is offering? Where did you get your info from? The disney web site does not say anything about being a disabled veteran. John – The information in the post was provided by Disney and Shades of Green. Now looking at the SOG website, it appears they have changed the terms, which I guess they have the right to do. Please call them concerning qualification, they are the ones who make all decisions. The Shades of Green website lists a 4 day adult ticket at $314. Your site says $138. Do you know which is correct ? I think you must be looking at the normal military tickets available through SOG rather than the limited time tickets currently available. My husband is in the ANGB, are we eligible for these tickets? He had orders this past April. Will these orders work for us? Rose – As with all eligibility questions, you must contact Shades of Green to see you if you qualify. Thanks for you quick response. I spoke with Shades and we are good to go. If a person is an active ANGB Reservist. they are eligible for these tickets as well. FYI. Rose – Thanks for the update, and have a great trip! Question, my husband (retired Navy), daughter, and I purchased the current discounted tickets (three total) and went in November. Since we’ve only purchased three tix’s can we purchase three more and go later this year before the cut off date? I didn’t see any fine print that says you can’t …but thought I’d ask. Hope my question makes sense. Veronica – You should be fine, Disney doesn’t keep track of who uses the passes, so as long as you have passes left you can purchase, you should be able to use them. Can I purchase two military salute tickets for use now and then the rest (4) in the summer? Also, do we all need to go to the same parks on a given day? Can My friend that is in the air force buy me and my family 3 tickets and go with us to disnneyland but he has a pass already. So he would only buy our tickets, would that still work? Eve – Sure, you can use them anytime between now and the expiration date. No, you can split up, do anything you want, the tickets are not linked to each other or to certain parks. Melissa – Not 100% sure, but shouldn’t be a problem. Keith, I purchased 4 day park hopper tickets for my trip in June. Do you know if it is possible to add waterparks and more option to them? I have called Disney and the sales rep was unsure. I called SOG and left 2 voice mails but no return call yet. I am hoping I can add the option or exchange the tickets at SOG when I get there. Keith – I would think so. On normal Disney tickets, you can add those options at any ticket window. I would think you would be fine to take them to Shades of Green and exchange them. I would keep trying to get ahold of them though, just to make sure. Keith, Can a veteran also get the $138 4-day hopper pass? “These tickets are for active and retired United States Military”. I would double check with Shades of Green though before you assume you qualify, it is worth the phone call. Keith, can an active duty military member buy tickets for the family at mwr on base and not go with the family to disneyland? Keith, my mother is a 100% disabled veteran and has an government issued ID card through the veterans. Does she qualify for any of the Disney discounts? Thanks! Linnea – As mentioned before, I cannot answer eligibility questions, you will need to contact Shades of Green. My question is similar to one asked before. I (Army spouse) want to purchase tickets for my children and their 2 grandparents to go to WDW. I will purchase them here at my local MWR. I am unable to go due to a move. So my question is, can they use them without me being present to show my military i.d.? Thank you for your help. Ryan – My answer is going to be the same as before, no idea. Please call Shades of Green, I will not answer questions on eligibility or usage, Shades of Green sets the rules, call them. Hope it works out for you and everyone has a great trip. I called and was told that the military service member or the spouse must be present with their ID…out of luck I guess. Karen – No idea, contact Shades of Green to find out, they will be able to give you the correct answer. Debbie – Each military member is allowed to purchase up to 6 four day tickets each. The tickets can be used by only one person. If you need 12, you will need to have multiple military members and each will have to purchase 4 day passes for everyone. Jerry – My understanding is that this is for US military only. I would suggest you contact Shades of Green though to clarify and/or state your dissatisfaction. the location is in Williamsburgh, VA. Thank you for any help on this matter. hi i would like to avail 4 day military salute with hopper in disney world. Zelbra – No idea, our information came directly from the press release. My guess is they/Disney decided to alter the dates after the original information was released. The Shades of Green website is updated with the correct December 26 date. Keith, we have a friend in the military who wants to give us Disneyland tickets for Christmas. if he buys them on base here in tucson, can we still use them in Disneyland without him being with us? i would hate for him to waste his money if we cant use them. Mike – Sorry, I refuse to answer any eligibility questions, I just don’t know enough about the military tickets to give you an answer I feel confident about.